Whether you are transplanting seedlings or a plant from the nursery, sunflowers are easy to transplant. This is a guide about transplanting sunflowers. 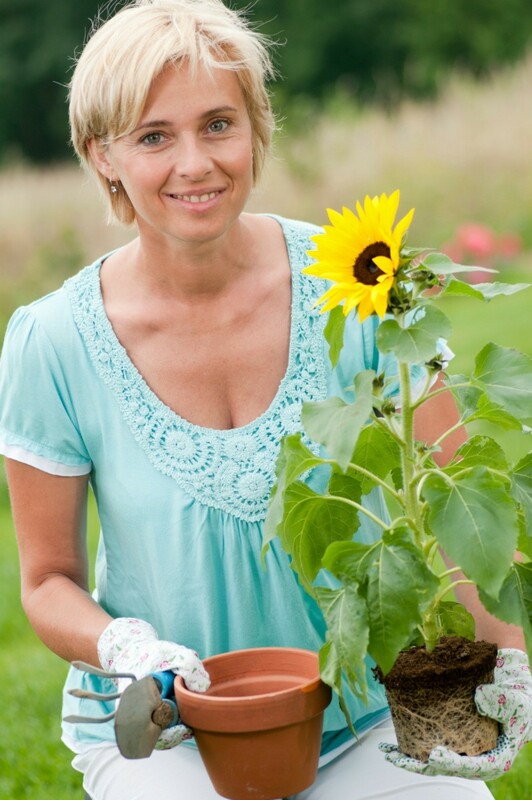 Can you transfer a sunflower from the ground to a pot without harming it? It's 7ft tall. While I personally would not, my reason is that they are too big and heavy to deal with and I physically I am not able to dig that deep--they have huge root spans) and even if I could, I don't think I could lift a 7 foot plant (too heavy). If you are physically able, you just need to make sure you can dig deep enough to get all the roots or you risk damaging the system and the plant dying. The roots can be three feet deep and three feet wide...more if the plant is really huge--7 feet is huge, but they can get WAY taller! Then you would need a pot big enough to house it all in. That in it self can be a challenge and then it is triple..plant, dirt, pot. That said, if you feel you can get to the root ball and have a big enough pot, go for it! Let me know how it goes! Hope you win!! I have transplanted 2-3 foot sunflowers successfully but a 7 foot - wow. Here is how the web site says to do it so maybe you could make it survive for a few days but I would bet it might not be able to survive the trauma from the first transplant much less the second (returning it to the original spot). As you can see this is dealing with transplanting to another location and not to a pot but your plant might look good long enough for the show. I want to replant a few sunflowers. Where do I start cutting? Do I stick the flower in the ground or pot first? Do I water everyday or once a week? There are over sixty varieties of sunflowers. Each one has specific needs for growth and care, but the basics are all about the same. You've planted the seeds, whether indoors or out, and now need to transplant or thin them out in the garden. The process will take a little time, but should result in undamaged sprouts or flowers in the end. Begin by digging small holes where you would like your seedlings to go. Make sure they are adequately spaced so the roots will have plenty of room to grow. You don't want to have to re-transplant them again in another month by spacing them to close together. Dig a hole about two or three inches in to the ground. Work the soil so it is loose and the roots can take hold and latch on, on the sides and bottom of the hole. If your seedlings are small and don't stand up on their own, you might want to use a stake. You can buy metal or wood ones and prop next to the seedling or tie it with some string. Popsicle sticks and wooden stakes cut down to the size of the seedling work best. The stakes will also protect against heavy rain and high wind damage. And like all young sprouts, they will attract wildlife. Rabbits especially like to eat the tender green stems of sunflowers. Its not uncommon to have a beautiful row or two of sprouts emerge, grow to six inches tall, and then be completely mowed down overnight by a hungry rabbit or deer. A fence made of wire or mesh might keep them out, at least until the seedlings can grow tall enough where the rabbits lose interest. A fence would need to be at least eight feet tall to keep deer out, and then it isn't even a guarantee. Human or animal hair placed near the seedlings may also repel their interests.good luck. I don't understand your question, "where do I cut?". I'm in central FL on the east coast and am currently growing sunflowers, too. I'd be happy to help you, if I can. I'm guessing yours are in the ground and you want to move them? How old are they? I planted mine from seeds in pots, then transplanted them at 4wks from pots to the ground. They are 7wks old now and getting bigger by the minute. Feel free to contact me. Hello there. First time planting sunflowers. Mistakenly I planted all the seeds in one single large pot. I'm wondering if I can transplant some of the to other pots? They are happy and healthy on my balcony along with my herbs and plants. I also believe that the roots will be all tangled together. Just afraid of hurting them if I do need to transplant them to give more space between them. Thank you much. I would like to relocate some older (about 1/2 grown) sunflowers. How can I do it without killing the flower? Thanks for any help or advice. Question: Can I Transplant Older Sunflowers? I want to move my sunflower plants from one area to another. Can I do this without killing them? If so, how do you recommend I do this?